Durham is one of the three famous Research Triangle Cities. It’s also the home of three prestigious institutes of higher education, including Research Triangle Park, Duke University, and North Carolina Central University. Though certainly the most underrated of the triplet cities, Durham has a host of things to offer to visitors and residents alike. The city’s rich history is built on the tobacco and mill industries, but it has since progressed to become one of the best destinations for learning, shopping, dining, and living in North Carolina. From its vibrant nightlife to wonderful festivals and great shopping destinations, Durham has something to offer for everyone. Because Durham is the home of three major universities, it’s important to begin looking as early as possible. The apartment search season tends to begin around May, peaking in July, and petering out around August. Though there are certainly properties available after August, it may be more difficult to find them. Durham is definitely the most underplayed of the Research Triangle Cities, but its recent cultural revival makes it an exciting (and affordable) place to live compared to Raleigh and Chapel Hill. The community here is incredibly vibrant and the people love their city. It’s easy to find friends and good neighbors here. Durham has many walkable neighborhoods for those without a vehicle, though the Durham Area Transit Authority (DATA) has limited service range and is not known for its reliability. Durham residences with vehicles can sleep easy knowing that their short commute to work in the morning won’t involve heavy traffic or stress. There is no shortage of nightlife and shopping in Durham. If you’re looking for some of the best restaurants and shopping in the area, check out the famed 9th Street. At Brightleaf Square, enjoy some of Durham’s finest dining among the architecture of old tobacco warehouses. If you’re itching for a shopping spree, don’t miss out on the sprawling retail district at Streets at Southpoint. Durham’s past as a booming center of the tobacco industry has certainly made its mark on the city. Residents and visitors alike enjoy touring the Duke Homestead and Tobacco Factory, the historic farm where Washington Duke grew his product and sold into the world. This idyllic location is both picturesque and educational. Of course, Bull City has more to offer than tobacco history. Enjoy taking a turn through the Sarah P. Duke Gardens, a beautiful 55-acre garden housing plants and exhibits from countries across the globe. You can also have a singular experience at the Duke Lemur Center, an 85-acre Prosimian primate sanctuary that allows you to learn all about these adorable creatures as you take a guided tour the facility. Many people claim that Durham is the best place to eat in the research triangle. From Southern-style tapas to down-to-earth burger joints, no matter what kind of cuisine you're craving, you'll find something to love in the area. Both Ninth Street and Brightleaf boast some spectacular eateries. University Drive is also home to many famous Durham eats, such as Nana’s Durham and Saladelia Café. The American Tobacco District in Downtown has also become a culinary hub for new and exciting restaurants. Eating your way through Durham is sure to be an exceptional experience! Much like Durham’s food scene, the bars in Bull City are flourishing. Unsurprisingly, the area around Duke University is crawling with bumpin’ clubs and dirt cheap dives, ranging from a wild-west themed dance club to a popular brewery. If you're searching for a more adult crowd, head over to 9th Street or West Main and kick back at an industrial brewery or upscale wine bar. Rigsbee Avenue is also home to a few popular hangouts, including an LGBT Bar, moody lounges, and a few hole-in-the-walls too. As long as you have a few bucks, you'll never go thirsty in Durham! Durham’s local culture is largely concentrated in music. A number of famous artists have once called this city home, ranging from popular folk groups to metal and rock bands. Some famous names include Iron & Wine, The Mountain Goats, Carolina Chocolate Drops, and Branford Marsalis. Concerts regularly take place in the local Carolina Theatre. Love a good play? Head over to the Durham Performing Arts Center for a top-notch play or Broadway show on tour. Explore the visual arts at the Nasher Museum of Art, which boasts a diverse collection that holds a wide range of pieces from ancient to contemporary. Durham offers many culturally centered events that residents can enjoy year 'round. In April, the Full Frame Documentary Film Festival attracts international attention as one of America’s largest fests. May brings the Durham Art Walk, a huge showcase of local artists' work right downtown. Each summer the city also hosts the American Dance Festival, the nation's largest contemporary dance fest. Lovers of diversity can also check out Bimbe Festival, a free African Harvest festival with out-of-this-world live music, a craft bazaar, and delicious food. These are only some of the awesome events that'll keep you occupied in Bull City! Durham provides a plethora of different ways to empty your wallet (and be happy about it). For a traditional shopping experience, check out the family-owned Northgate Mall. This shopping center offers many traditional mid-range shops, along with a movie theater and Trampoline Park. For a little more variety, check out The Streets at Southpoint. Looking for smaller, more unique stores? Check out Brightleaf Square, which houses charming boutiques in a restored tobacco warehouse. Ninth Street is also a first class Durham shopping destination, particularly for the college crowd. The local college teams define sports culture in Durham. Duke University's basketball team boasts a loyal following, commonly called the "Cameron Crazies." In fact, The Blue Devils always sell out games in the indoor stadium and are known for their many NCAA championship wins. If you're more of a baseball lover, you can always chow down on some hot dogs or peanuts at the Durham Bulls Athletic Park while you enjoy a lovely minor-league game on a summer afternoon. Durham may not be home to many traditional urban parks, but it does offer some interesting recreational spaces for its outdoorsy visitors. 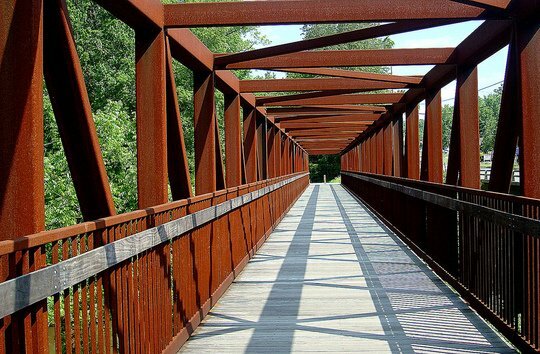 For a little exercise, run, bike, or rollerblade on the American Tobacco Trail, a paved path running from downtown Durham to Raleigh. If you want to be immersed in nature, head to Eno River State Park. This 4,200-acre wooded park encompasses creeks, meadows, and a quarry. Enjoy exploring the park’s many nature trails, picnic areas, and canoe launches. During the spring, many people enjoy spotting groups of passing deer or enjoying the sweet smell of nearby wildflowers!